I was supremely excited for St. Patty's day this year. Every year we dress in green, and the kids and I really enjoy ourselves. But this year would be different, for we had family coming into town and I really wanted to make it extra special. 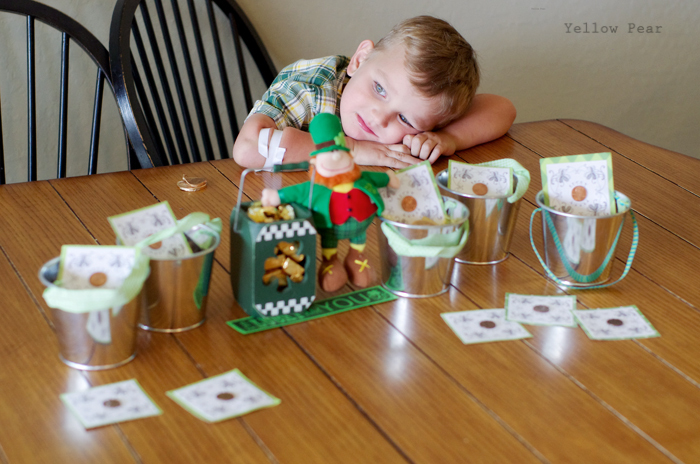 I first decided to do pots of gold (chocolate) for each kid. 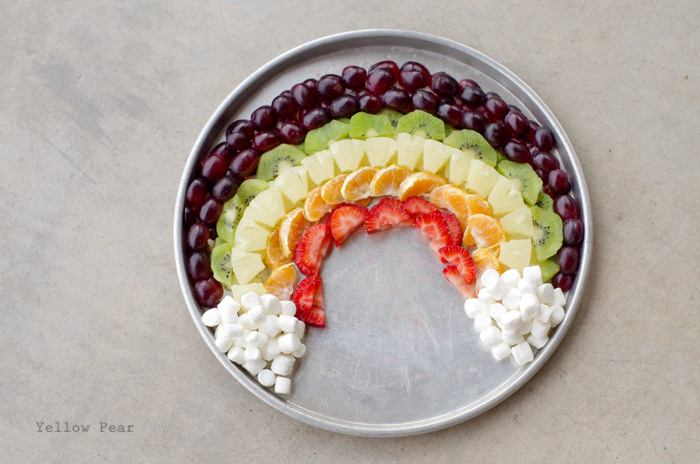 And because I was planning on all that candy...I thought we should have a healthy breakfast, which of course had to include a rainbow. So of course they were able to have their "gold" at the "end" of the rainbow. 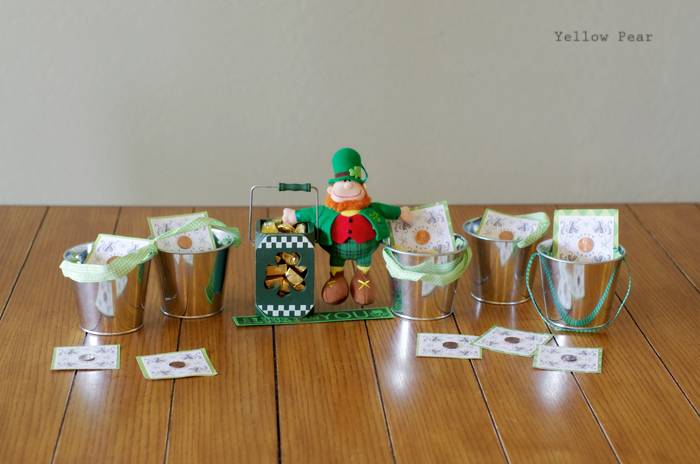 We included Hershey's Treasures, Werther's, gold coins and Rolos in their pots. I found the cute galvanized pots at Target. 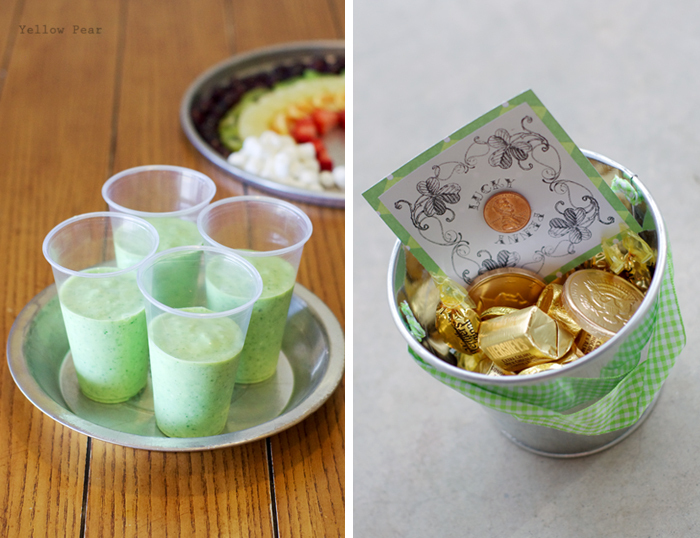 Along with the fruit rainbow, we had green smoothies. Although not everyone was a fan. Some were afraid of the color, and some didn't think they were sweet enough. But there were still plenty of us that DID enjoy the green goodness. We also had green eggs and ham. 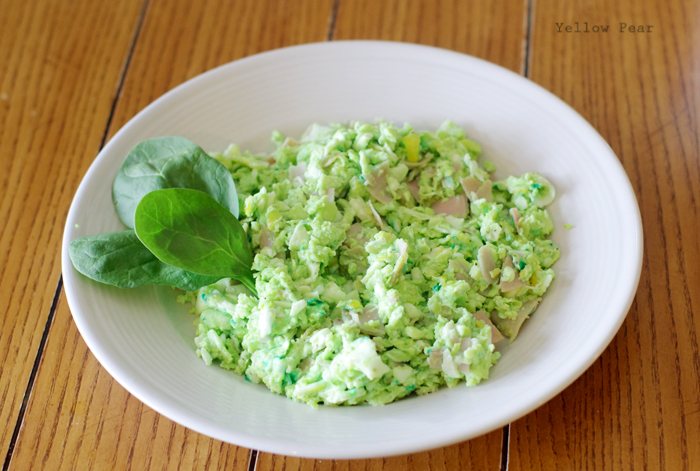 For some reason green eggs cannot be served without ham. It's a rule or something. The little kids were not thrilled with the green eggs. Then Q thought he might die waiting to dig into the chocolate. Also he burned his arm. He is a walking accident-waiting-to-happen these days. We falls down, he stubs his toe, gets his finger smashed (my fault), burns his arm, bites his own fingers, bonks his noggin and gets assorted scrapes, bruises and bumps. All boy I guess. Rough and tumble as they say. But. He is one of the toughest cookies I have seen. It takes a lot to make him cry. 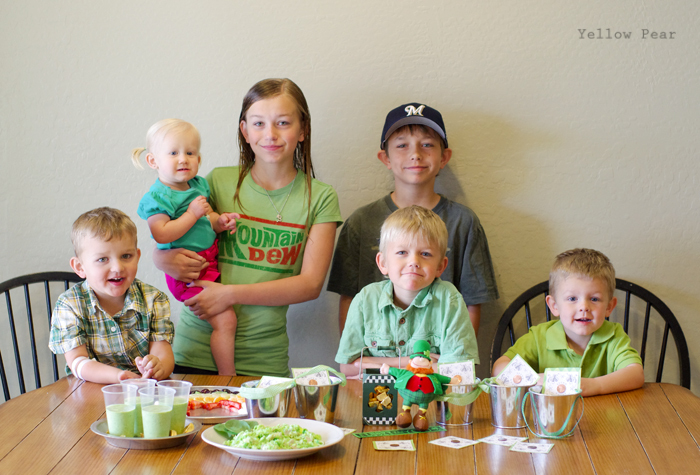 The bunch of wee leprechauns wore their assorted shades of green, varying from teal to olive and everything in between. 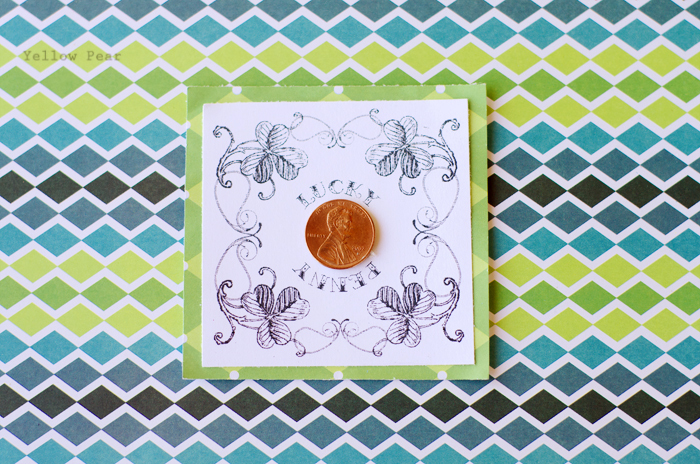 I gave Lucky Penny cards to each family member, personalizing each card with a penny of their birth year. I searched high and low for everyone's specific year. My mom and aunt's pennies were obviously the hardest to find, but find them I did. I love a good hunt. It is so thrilling. Even if it is a penny hunt. 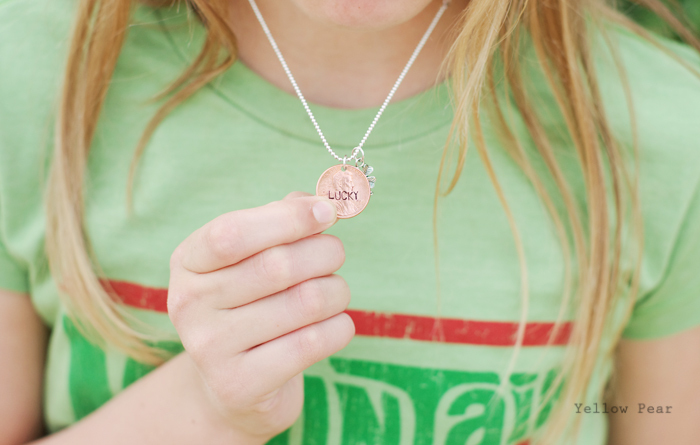 I bought Miss B and I penny necklaces with the word, "Lucky" stamped into the penny, along with a little four leaf clover charm because they were so cute, I couldn't help myself. For dinner, we made corned beef and cabbage with red potatoes and homemade bread. 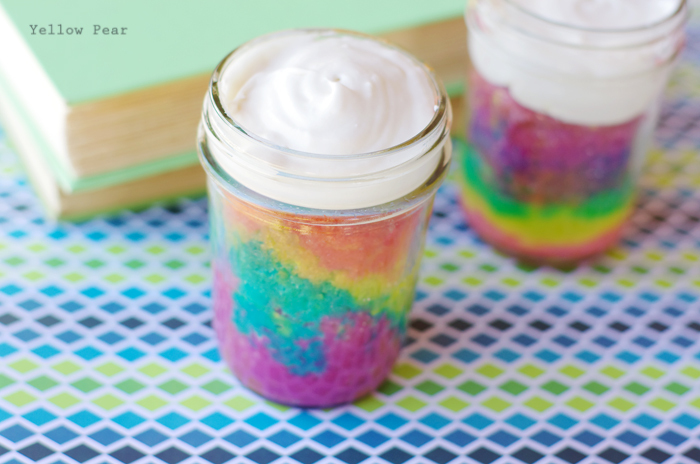 My sister and I made rainbow cupcakes in jars for dessert, which was super fun and colorful and I've been wanting to make them for ages. The kids LOVED them. And so did the rest of us. They were just so pretty. The corned beef and cabbage was pretty tasty, however we served hot dogs to the kids (which was a smart move I believe). The only other things I wanted to make were Irish soda bread and Irish pancakes, but that may have been a bit overkill, eh? In the middle of our food festivities, we went to a gorgeous citrus orchard and picked a plethora of superb citrus, found a lucky horse shoe (no lie), and then the menfolk went to a baseball game. We also picked up my brother from the airport, did some shopping and met up with some cousins that evening. Then after they left, we put the kiddies to bed and watched Leap Year. I still can't believe we did so much in one day. It was one of those days that kept going and going. It was absolutely perfect. Except once when I got irritated and then a little gloomy and probably put a bit of a rain cloud over our nice day, when I learned everyone had to leave a little earlier than expected. And it bugged me that I let trivial things irritate me and get to me. Gah. Dorky human being. But other than that...perfection.